Imitate the interplay of change the different musical instruments. When imitating the playing of more instruments simultaneously, switching between them is essential. The patented function ACTIVE CHANGE® of instruments controls the presence and volume of individual instruments in various ways. The operation depends on the settings you can adjust to your needs. You can change any single or multiple instruments at once. Change can be step-by-step (on / off) or continuous (overflow). Only with patented function ACTIVE CHANGE® of instruments you can completely precisely imitate the sound effects of large musical ensembles (Alpine quintet, symphony orchestra with soloists…). 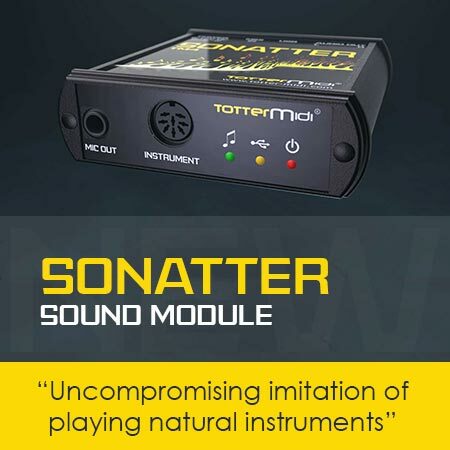 Check out unique patented TOTTER MIDI QUINTET® and TOTTER MIDI GUITARIST® functions.